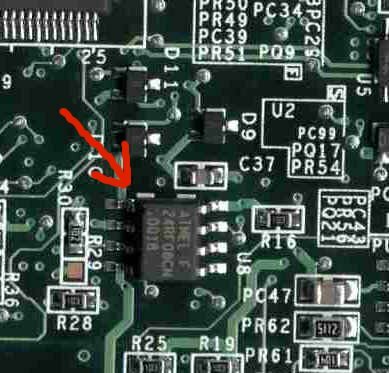 If your ThinkPad is a newer model and is not a T*40 or X*40 find the EEPROM yourself by following the instructions below. Once you have your HMM search the manual for "Removing and replacing a FRU" System Board. Follow the instructions in the HMM to remove the System board, the HMM will list all the other modules which have to be removed and also the order in which to remove them. Do heed the warnings in the HMM about handling the System board carefully so as not to trigger the shock sensor. Once you have the System Board in your hand, look for one of the Integrated Circuits [ICs] listed below. Usually the IC we are interested in is covered by sticky black or clear plastic sheeting. While searching for the IC, you will need to carefully peel back the plastic sheeting. Sometimes the IC is hidden under a plastic piece, a bracket etc. 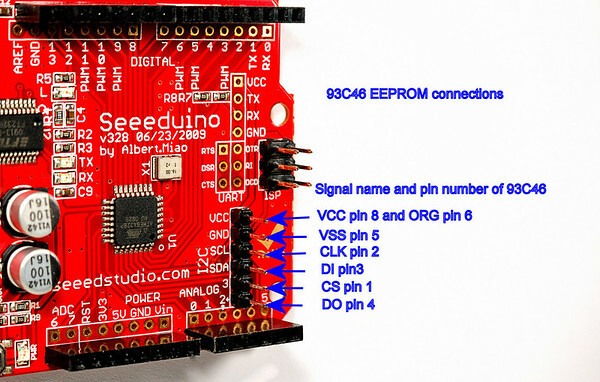 If you are only willing to allocate 30 seconds toward finding the eeprom then it is best you quit right now. You need to be extremely thorough in your search. 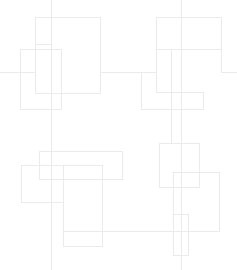 This will take more than 30 seconds, it WILL take quite a while, even if your vision is 20-20. You do need very good strong lighting even if your vision is 20-20. Some eeproms are very SMALL and the Laser etched part numbers are hard to see (even if your vision is 20-20) specially if the Laser etch markings are covered with glue from the plastic sheeting covering it. You need to look on BOTH sides of the System board. You do need to LIFT ALL black plastic sheeting covering components on the system board and LOOK UNDER THE BLACK PLASTIC SHEETING. This is NOT rocket science, you are looking for particular part numbers on small chips that are on your system board. 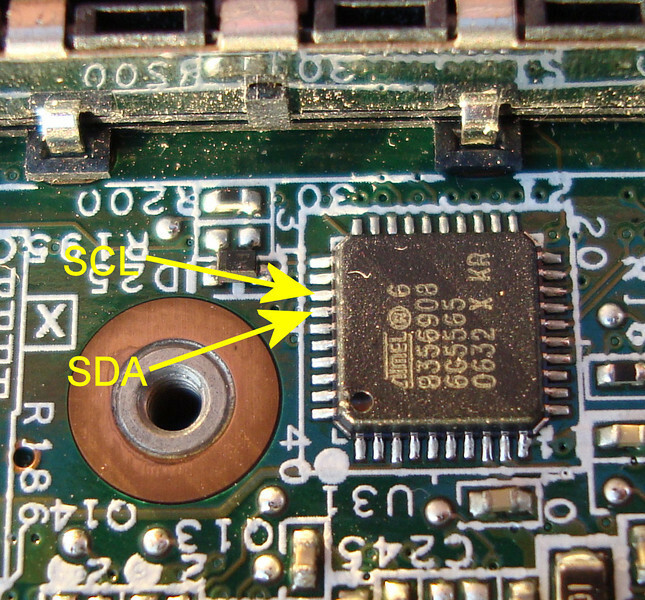 DO NOT connect to any chip unless you have confirmed that it is in fact one of the EEPROMS listed below, not room for errors or experiments that can damage your ThinkPad. Note: you are only looking for the chip, parts around it might be different. Pin 1 marker is the white number 1 on the System Board, also note that the left side of the IC itself is chamfered on the pin 1 side. DO NOT use the GND connection depicted below, see notes at the bottom of this page for GND connection. 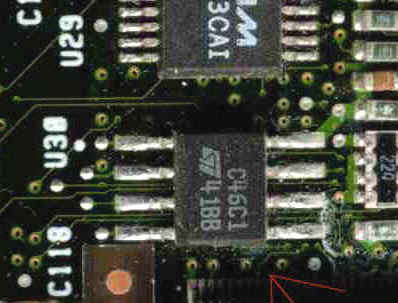 Pin 1 marker is the white stripe [top left] on the System Board, this IC also has a dimple [top left] as Pin 1 marker. Pin 1 marker, there is a small notch [top left] on the IC body, the left side of the IC itself is chamfered on the pin 1 side. Pin 1 marker, the left side of the IC itself is chamfered on the pin 1 side, there is also a dimple [top left]. 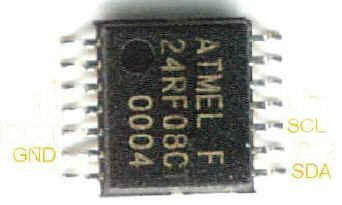 The ATMEL 8356908 or 8356908, the laser etched part number is difficult to see. easiest way to look for it, it has 40 pins - 10 on each of the 4 sides = 40 pins. The circular dimple - [top left] in the black IC body is also the Pin 1 marker on the IC itself. 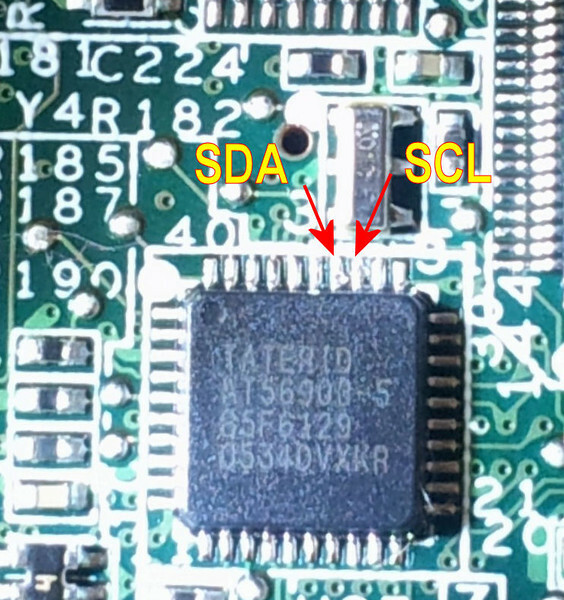 Use the Pin 1 markers to orient the IC on your System Board so you can positively find the pins labelled SDA and SCL above. 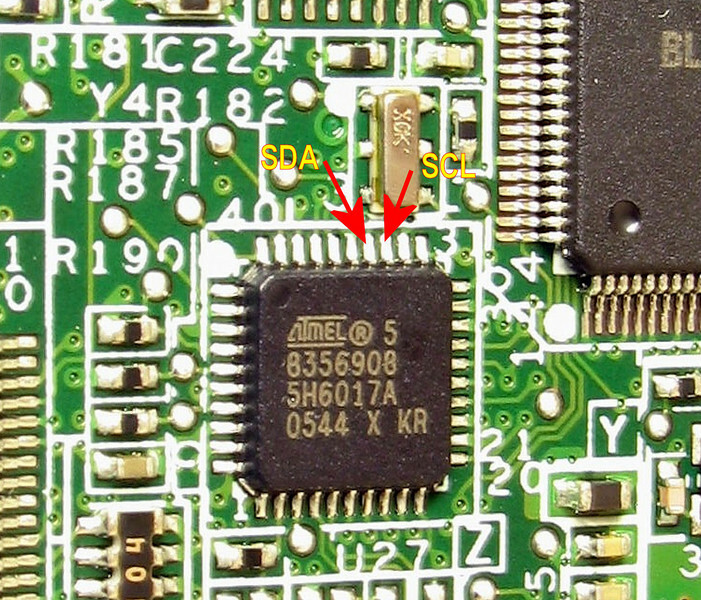 Once you find the ATMEL 8356908 or 8356908, you may see 2 pull up Resistors near the pins labelled SDA and SCL in the photo above. Sometimes there are no resistors nearby, they may be far away from the IC, maybe on the other side of the board. 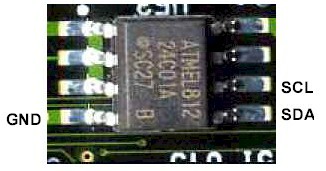 If the resistors are nearby, follow the thin traces on the board back to the pins on the IC to confirm the resistors are indeed connected to the SDA and SCL pins of the ATMEL 8356908 or 8356908. 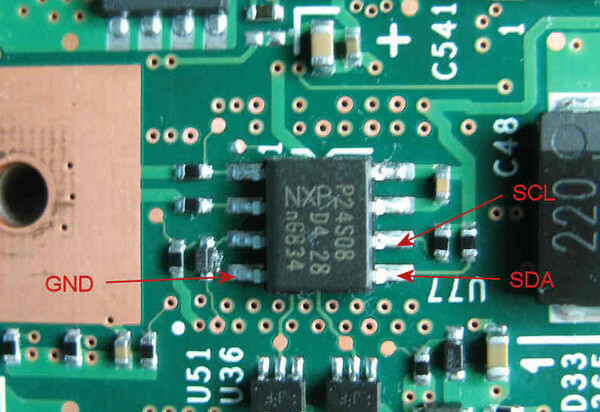 The reason for finding the resistors is - that is is MUCH EASIER to connect your KeyMaker probes to the resistor rather than the pins themselves - BECAUSE the pins are very small and very closely spaced, the resistors a BIGGER and further apart- it just makes the task EASIER. Pin 1 marker, the white number 1 [bottom left] on the System Board, the dimple [bottom left] on the IC itself. 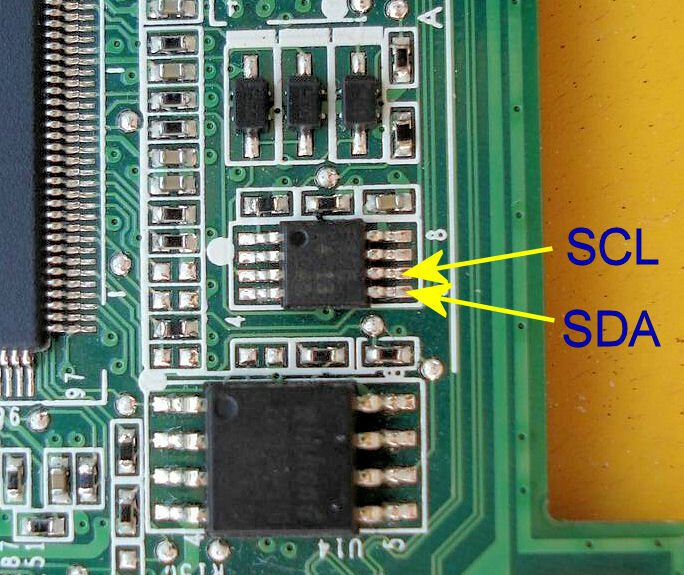 The pins Labelled SDA and SCL in the photo below are very closely spaced, follow the trace from each pin to the nearest pad, it is MUCH easier to use those pads because they are more widely spaced. 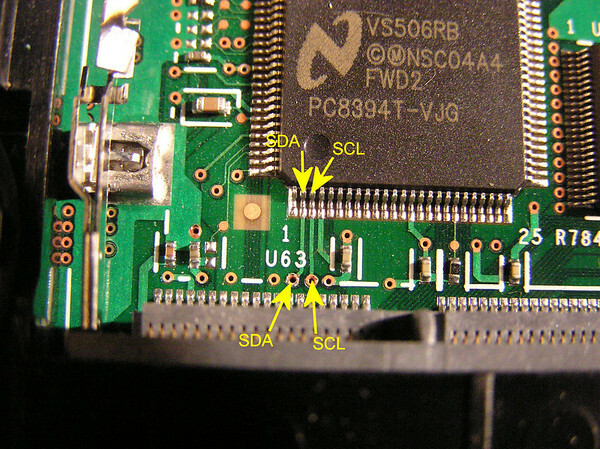 Pin 1 marker, that dot [top left] just before "SC27", the left side of the IC itself is chamfered on the pin 1 side. NOTE: see the white paint dot [top left] just to the right of U38, that white paint dot is the Pin 1 Marker. --- WARNING --- 93C46 cannot be read in situ on the System Board. The unsoldering process requires special tools. DO NOT attempt unsoldering a 93C46 UNLESS you have the right tools AND you know how to use them. 93C46 connections to ATmega328 based KeyMaker interface. 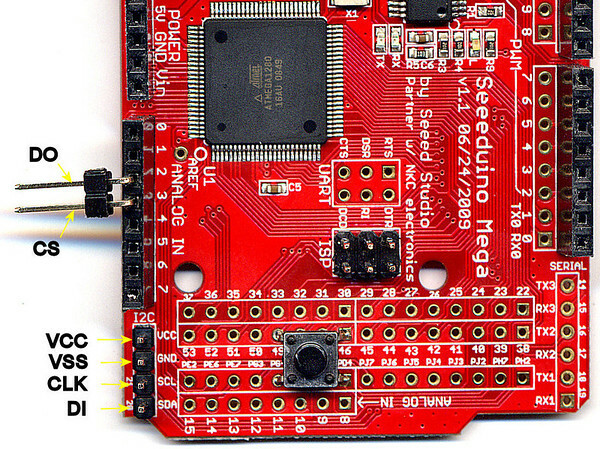 93C46 connections to ATmega1280 based KeyMaker interface. This is not easy, you will need to have the Keyboard [and optionally the LCD] plugged into the system board in such a way that none touch any contacts on the system board, use paper as an insulator to keep things from electrically shorting out, later you will need to plug in the AC adaptor and switch ON the TP, then you will need to hold 2 probes in place to the SCL and SDA points under the system board. 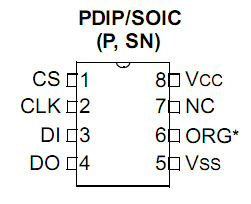 In most cases the IC we need to connect to in order to Recover or Clear the SVP is underneath the System Board. Taking the System Board out to reach the underside is a real pain. If you have a multimeter and you know how to use it to check for continuity, you can usually [not always] find a short-cut. 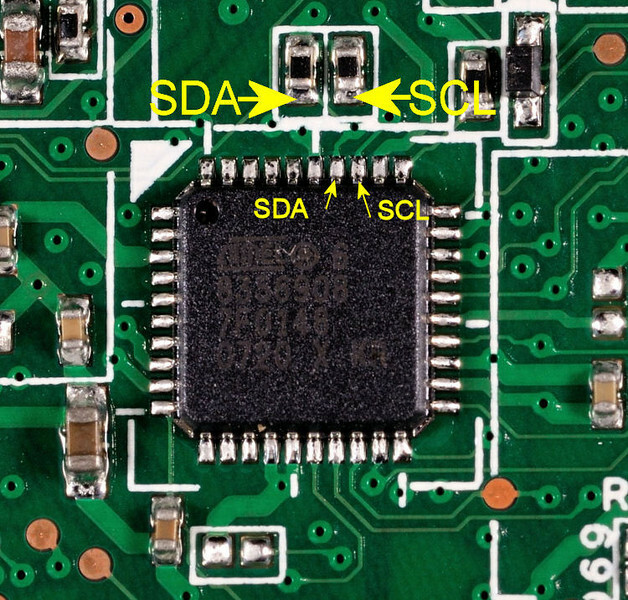 Follow the traces leading away from the SDA and SCL pins on the IC, the trace may connect to the top side of the board by way of a via, turn the board over and see if that via on the top side of the board happens to be in a location that can be reached from the top WITHOUT having to remove the System Board. Perhaps that via on the top side leads to another via on the top side which can be reached without removing the System Board. If you find a short-cut for a particular model, please take some decent photos and share it with me [email me] so I can publish it here and share it with everyone. 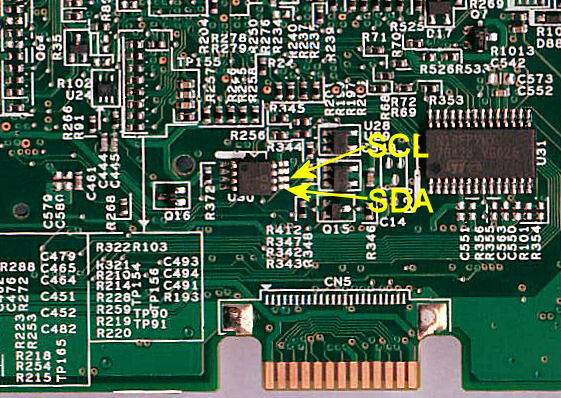 Two photos will do, one showing an overall view, the other showing a close up of the vias or pads to connect to for SDA and SCL. If your ThinkPad model is not on the listed in EEPROM Locations and if it is an older model email me as I do have information on nearly all the old ThinkPad models, I am publishing them here as customers request that particular old model.